Commiserations to our brazilian friends for the football - some consolation here in the form of twenty-three storming rhodes tracks from, or inspired by their great land. 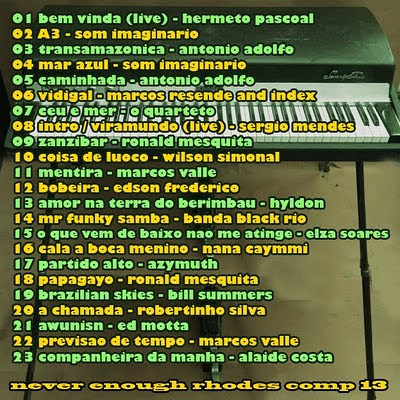 A brief intro from the master, Hermeto Pascoal, leads us into some jazz-fused bangers from Som Imaginario, Antonio Adolfo, Marcos Resende and others. O Quarteto's clustered vocal tones take us through some live Sergio Mendes and Brasil '77 into the middle section, fusing pop, funk and soul with Marcos Valle, Hyldon, Banda Black Rio and more. 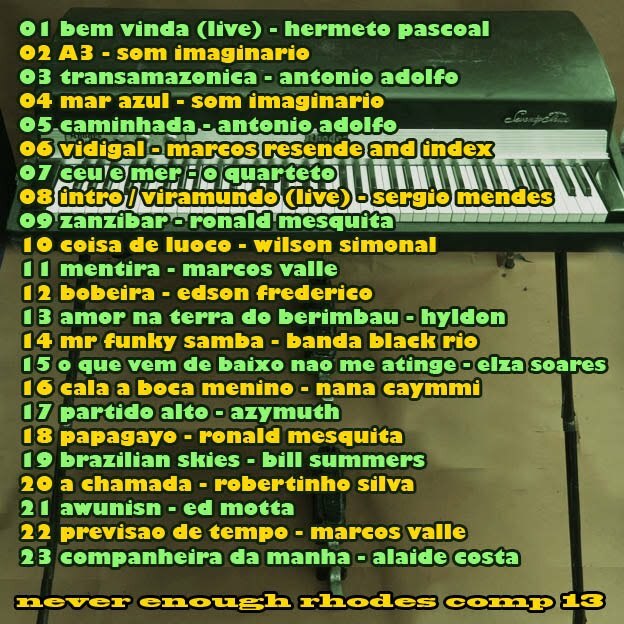 The fusions of Azymuth and Headhunter Bill Summers (check that keyboard solo) leads us back to the atmospherics of Robertinho Silva and the deeper jazz of an uncharacteristically instrumental Ed Motta, before we finish with the beautiful melancholy of instrumental Marcos Valle and the amazing voice of Alaide Costa accompanied by Oscar Castro-Neves. & all 13 rhodes comps?!?! Yow! Where have I been? I'm on it & a big cheers Simon for your labour of love! Thanks for another fine compilation, Simon. Thank you! I love all of your comps (you have a great ear)! Can't wait to check it out! no need to mess around with the excerpts, straight in with the DL. thanks as aways Simon, I know it's going to be another crackerjack. Man, it is really cosmically unfair that I can't get most of your shares (or anyone else's) from my current home due to my crappy ISP's issues with doling out IP addresses. I will try to grab this from a wireless hook-up next time I am in the city, it looks delicious. Well I hope you can get it Flabbergast :) Thanks also for your kinds words on the Gil Scott post, which I just read. Nice to see you posting regularly again. Neverenoughrhodes is my favourite blog when it comes to music. Looks like just the thing for a two hour drive tomorrow. Thanks. Congratulations! This compilation was very well done. Great artists and wonderful tracks. About the football, it was a desilusion, a shame!!! But...we can not win always. Looking forward 2014! And thanks all for the comments! Thanks for sharing some lovely funky sounds & some equally lush melodies. Your hard work is always appreciated. Great stuff. A lot of these cats are totally new to me and all of them are killin. Thanks! If you get a minute and feel like watching some musical videos check out something I just started putting together. There are no words man! WOW!!! I just got all three Brazil comps. I'm lovin every second. Thanks!!! 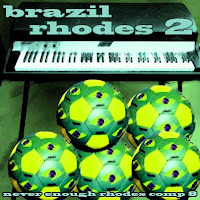 I was on my way to Central Park to see a free show UNTIL I saw that you had posted the Brazilian Rhodes compilation. Indoors it is, these tracks have enough sunshine. You are greatly appreciated!! I'm not seeing the link. A hint? Suffering Rhodes withdrawal symptoms so I'm back after too long. Looks like a stormer of a comp, Simon! pawlyshyn, see the first comment for the link. outstanding effort indeed, simon. i don't know if it's physically possible, but i do hope that you NEVER EVER stop posting recordings, particularly rare gems like these. As I said in the Library Rhodes comments (! ), a perfect summer soundtrack. and thanks all for comments ..
Wow! Can't wait to listen to these comps. Your work is much appreciated! 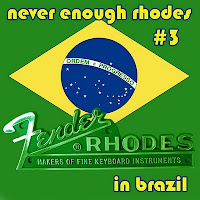 The Rhodes ( which I love playing as an amateur seems particularly RIGHT in Brazil mode! Hey, just wanted to say how much I appreciate your blog. This is truly wonderful stuff. But I have a burning request. You seem to know a lot about Brazilian music. I have this song off a radio show, truly an amazing singer with a poignant timbre to her voice and the backing rhodes, well it's what keeps me playing. But I don't know the name of the song and I can't for the life of me pinpoint who the singer is. If I were to manage to get this song to you somehow, do you think you can help me out, or maybe some of your readers? If you read this, you can contact me at malzabon@hotmail.com, and my name is Christo. Regards. Hey, me again, Christo. I found the name of the singer and the song. She is Nana Caymmi, Brasilian, and the title of the song is, "Essas Tardes Assim." Thanks to all. And keep the music alive Simon! Fantastic! I can't take my ears off it. Thanks a lot. Great compilation man, whats that hermeto from? magic music.... thank you for lettin' me know thos great musicians! awesome stuff! blog has me falling in love with the rhodes. Wow, THAT is yummy stuff! Where could you sniff such treasures out? You must have a golden nose for tracing great music. Dude, why do you use Rapidshare? It's the worse and takes for ever. I wouldn't give them any business anymore. Anyway, your stuff is great. Isn't that the truth!!! - Thanks for all your hard work and shares Simon666. Your Hip-Hop comp was fantastic and turned me onto some great artists as well as reminding me of some I hadn't kept up with. Any chance of another? Thanks so much for this share, I like so many of your comps but this one is on non-stop.. tight jazz, mellow grooves and Astrid's voice, full of beautiful nostalgia.. lovely.